Sean McManus's Writing blog: How will Steve Jobs resignation affect Apple? You are here: Home > Blog Home > Sean McManus's Writing blog: How will Steve Jobs resignation affect Apple? 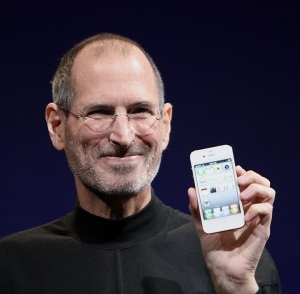 How will Steve Jobs resignation affect Apple? Steve Jobs (pictured right in 2010) has stepped down as CEO of Apple, but will continue to be chairman. While Apple argues it will make little difference to the company’s operations, the stock market disagrees. The BBC reports that Apple shares fell 5% in after-market trading on the Nasdaq, and fell 4.1% in the secondary listing on Frankfurt’s stock exchange. The BBC also implies that a 4.1% rise in the share price of HTC and 3.2% rise in Samsung’s share price are also related to Jobs stepping down. Apple has a talented team, including British designer Jonathan Ive who led the design of the iPod and the iPad, so the company remains in a strong position to innovate and grow. But many people, including many shareholders, perhaps, believe that a lot of Apple’s vision has come from Jobs. 'Revolutionary' is a word that's overused in technology PR and journalism, but Apple really has transformed entire industries under Jobs' leadership. The company has completely transformed the music industry, to the extent that Apple is arguably the most powerful company in the business, making huge amounts of money from the hardware and being one of the leading retailers for downloadable music. Apple ignored the conventional wisdom on how the mobile phone market worked, and changed the game there too. Before the iPhone, handsets were free and operators got most of the money. Now, many people are willing to pay for an iPhone, and a huge chunk of the money in the industry goes to Apple, for both the hardware and the apps on the phone. Apple has also dramatically reinvented the software industry. The app store model has changed the way that people discover and buy software, and has also made them much more likely to do so. People who wouldn’t enter a software or games shop are happy to buy apps, and a whole industry of amateur app developers has grown up to create those apps, some of whom have become fantastically wealthy. Apple has also led the way with tablets, inspiring lots of other companies to try to emulate the success of the iPad. Now it’s a huge success, it’s easy to forget that a lot of people didn’t understand the point of the iPad when it first came out. It was a big iPod, or a computer without a keyboard: it seemed to be neither one thing nor the other. I didn’t get it until I tried one, but when you try one, you see how easy it makes it to do the things you usually do with a computer, and how enchanting the whole experience is. I’m a huge fan of the device, so much so that I’ve written a book about the iPad. Apple hasn’t always been first to market with its ideas. There were MP3 stores and software downloads before Apple, for example, and there were portable music players before the iPod (including the Rio, which I reviewed for Making Music in 1999, and which could store an amazing 30 minutes of music by default). But being first to market isn’t always the most important thing. Apple shows that you can take existing ideas and improve them, design elegant products, and customers will follow. Jobs will stay on as chairman of the company, so it can continue to benefit from his vision and ideas. Freed up from the day to day responsibility for running the company, Jobs will be free to focus his energies purely on generating ideas and helping to direct strategy. For a company led by sometimes daring ideas, this could make Apple even stronger. (Photo of Steve Jobs courtesy of Matt Yohe, via Wikimedia Commons).